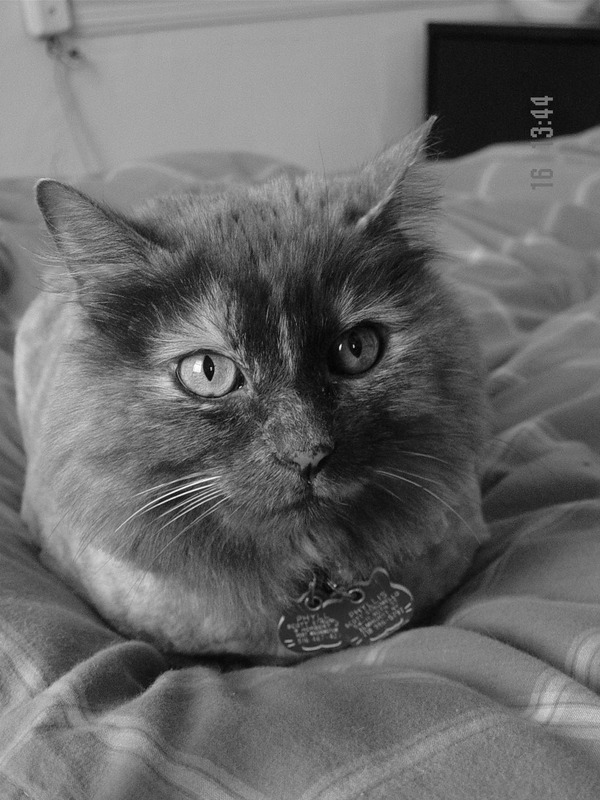 Today, I am mourning the loss of my long-time feline companion, Phyllis, whom I had to have euthanised this weekend. Phyllis' stopped eating over a week ago, so I brought her in to see the veterinarian. After some tests, x-rays and the like, the vet told me that she had a large mass (a tumor) in her abdomen and the only way they could address it was to perform surgery and open her up. But he was unable to provide any degree of certainty about the procedure given her advanced age and the fact that without a biopsy, they did not know if the tumor was malignant or not. That would have cost $2,200 and the odds of success were about 25%. Not only would it drain my bank account, but if it was malignant, that would have been the last time I would have seen Phyllis anyway because the vet would not go any further. I don't like to gamble with a loved one's life (including a pet), but that was not a wise bet. Instead, I chose to bring Phyllis home and let her spend the last days of her life -- however long that might be -- in familiar and comfortable surroundings. She was not eating, so the amount of time she could remain without nutrition was limited anyway. She did drink some low-sodium chicken broth that I gave her, which did enable us to have some quality time over the weekend. But by Sunday evening, she was starting to be visibly uncomfortable, notably because she only used her litter box to urinate, but no bowel movements for nearly 2 weeks. After some soul-searching and research, I concluded that I did not want my pet to die of starvation or severe pain, and the vet did offer the service should it become necessary. But there's a high degree of pain involved in the decision. There's guilt over whether I made an appropriate decision, and also grieving the loss of a long-time companion. However, I concluded it would be less humane for me to allow her to suffer so much pain and agony so that I could enjoy a few more days with her. But I still feel awful about the decision and it will take some time for me to overcome that grief. I wrote most of this post in the days that I still enjoyed her company while she was still reasonably healthy. I am not typically a very emotional person, but as I write this, I am finding it extremely saddening. (FYI: I knew her passing was coming, so I wrote much of this post while I still enjoyed her last days with me) Alas, I take comfort in the happy memories my former longtime companion will bring me. For those of you who haven't read about Phyllis here in the past (catch some of my former posts HERE and HERE), she was my cat (or "Pusa" in Tagalog ... long story on that which I don't have time to explain today) and she really was a long-time companion -- about 17 years as best as I can estimate. Phyllis lived with me since I moved out into the world on my own. I adopted Phyllis shortly after I moved out of my parents house on my own for the very first time. At the time, I had relocated from the East Coast to the San Francisco Bay Area/Silicon Valley and was truly on my own for the first time. A couple I was friends with had recently adopted a beautiful Siamese cat (with those stunning blue eyes) from the Santa Clara Humane Society (I believe it has relocated from Santa Clara proper since those days), and discovered that the new cat was pregnant and had just given birth to several kittens -- one of whom I adopted, and her name became Phyllis. Although Phyllis does not have blue eyes, she did inherit her strong vocal skills from her Siamese mother, as she talked, sometimes incessantly. Over time, that became an endearing quality that I learned to love about her. Anyway, at the time I adopted her, I shared a large apartment with a computer tech guy (it was Silicon Valley, after all) whose work schedule was mostly nights and on weekends, so I really was alone a lot at the time. My very sparsely-furnished new apartment had minimal furniture at the time, not even a bed -- just a mattress on the floor and a closet full of business suits (we still wore them to work in those days) and shoes and a television. Anyway, Phyllis and I bonded and I took her in the car on trips to the carwash in Sunnyvale (where I lived at the time) to get her acclimated to travelling. I moved a few times while I was still in California, including to an apartment nearer to SF in Foster City, and finally to a 4th floor walk-up studio apartment at 2228 Union Street in San Francisco (in Cow Hollow, although truth be told, since the first floor was a retail store, it was actually on the 5th floor). 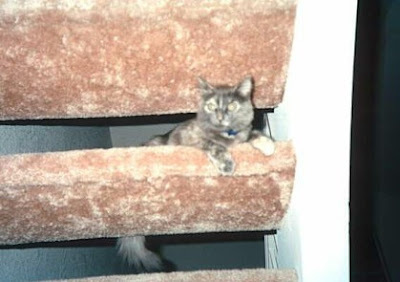 Phyllis adjusted well to each of my moves like a champion, although I found that the windows in many apartments in San Francisco don't have screens as they do in other parts of the country, and with a kitten that liked to jump, Phyllis nearly plunged 5 stories until I addressed that -- with a fast trip to Home Depot! After a number of years, I relocated back East, this time for a job offer I received in Wilmington, Delaware. That became Phyllis' first travel experience by air, and she was able to travel in the cabin with me under the seat in front of me. Although I had given her a tranquilizer pill the veterinarian provided for me, Phyllis was actually extremely well-behaved and didn't even meow and the pill only lasted a few hours. I unzipped her Sherpa carrier and she actually was able to stick her head out and observe what life as a road warrier was like first-hand. I think she found it fascinating, and as long as she was with me, she was extremely well-behaved. We even connected at another airport (I think it was Chicago O'Hare if memory serves me) and she experienced moving sidewalks and life in the airport terminal. She also helped keep me company as I was travelling alone at that time, even though I had friends in the Delaware Valley (including Philly) area waiting to pick us up at the airport when we arrived. Upon arrival, Phyllis and I lived for a time in a Residence Inn in Newark, Delaware (Phyllis scared a few cleaning ladies who came in to make the bed when they saw a lump in the bed start moving) until my personal belongings arrived from the West Coast, then we moved to an awesome apartment just outside of Philly with a big, wide window sill (it was a picture window, no less) overlooking a courtyard (this was on the Main Line, after all). Phyllis really loved that apartment because it was so perfect for the feline persuasion-an elevated picture window with a wide sill for sitting in the sun while overlooking all the activity down in the courtyard below (not to mention a few birds who flew by, or a chipmunk or two who were in the tree next to the building). Then, I moved to New York after the company I had worked for sold the business I was working for to another firm, and I've been here since. (I realize this is more personal info. than I typically blog about, so I hope no one minds). On the diabetes front, Phyllis proved herself to be my hypoglycemia alert-cat on more than a few occasions over the years. In fact, she woke me from a few in the middle of the night. A few years ago, I entered her in a contest from a local newspaper and she won third prize for "Smartest Pet" contest (although it is worth reminding everyone that she was declared the smartest CAT since dogs were also in the contest) for her lifesaving skills! One thing about Phyllis was that she was almost always with me. She travelled on weekends to my parents' house, and she went to my family's summer home at the lake. She generally liked travelling and was very good in the car, even though she didn't necessarily like being placed in her carrier. As I indicated, Phyllis was 17 years, which equates to about 84 human years. She lived a long and arguably good life. But she stopped eating about a week or two ago, so I brought her in to the veterinarian. The vet felt some kind of tumor in her abdomen and took some x-rays. But without surgery, he could not tell if it was even something that could be removed, but he said if it was cancerous, he would not even attempt to sew the incision up; he would simply euthenize her right then. Given her advanced age, he felt it may not be worth doing, especially since the cost would be anywhere from $1,600 to $2,200. With such little certainty, not to mention the cost, I decided that it was best to bring Phyllis home to familiar surroundings and let her spend her time (however long that may be) with family. If she was in a great deal of pain, I could decide then to euthenize, but that would only be if she was in severe pain or duress. In her last days, she remained mobile and continued to drink water for the most part, but it became harder for her to "speak" and move the way she once did, so jumping up and down from furniture was very limited. This cat used to sleep on top of my refrigerator in a previous apartment because she had a bird's eye view and the heat from the back of the fridge was just what she liked, so seeing her in this condition was very troubling for me. As a result, in her last days, she mostly slept, which was very common for her, but knowing it was less of an option bothered me. I recognized that she felt unable to do what she had always done, and it made me very sad. It's like any family member, except with a pet, you cannot speak with them and know whether they understand you, nor can they always communicate their needs with us. That is very troubling for a pet that becomes ill, so we do our best hoping to make the right decisions. On Sunday, January 23, 2011, my 17-year companion Phyllis passed away. Her death was not unexpected, but its still incredibly sad for me today. I am putting her picture here in black & white to mark my feelings on this occasion. Now, I have lost loved ones before. But I'm finding this more difficult, in part, because unlike people who can usually say things until they have passed away, with an animal, there is less certainty, and therefore I think finding closure is more difficult, too. I know I bonded with her over the years, even if we weren't always on the same page, the relationship was unconditional. Even if I scolded her for knocking over a glass and having it shatter all over the floor, she would come up to me shortly thereafter and rub her head against my leg, and I ended up forgetting about it. There is an old belief that the stars shining in the night sky are the spirits of those who have died. They have shed their earthly bodies and exchanged them for bodies made of light; thousands upon thousands of our dear departed friends all promoted to glory in the night sky. There is another saying that the brightest flame burns the shortest. My friend, you were the brightest star in my own universe. While I burn on, my flame dimmed by grief and despair at your passing, the stars are watching me. They are too far away for me to touch, just as you have gone somewhere I cannot follow until my own star-time comes. They cannot be held close for comfort, just as I can no longer hold you close, though I held you close to comfort you in your final hours. We were together for such a short time, but the stars will burn forever. One day I will grow tired of this earthbound body, my own star-time will come and my spirit will soar into the sky to burn with all those friends who have gone before me. On the inky cloth of space we will be reunited in constellations of joy. Until then, my flame burns low and dim and cold without you. Through my tears I look upwards to see if you are watching me and what do I see? I would just add to this poem that the new star's name is Phyllis. Goodbye my dear companion - all I can say now is that I miss you, but someday we'll be together again! Scott, I am sorry for your loss. I can read in your words the care and consideration and worries about having done right by Phyllis that we face whenever we have to make life-and-death decisions for a loved one. It scares us that we might have contributed to someone's early demise by following a "do not resuscitate" order or by opting to donate (or not donate) organs after death. And it scares us to have to face life without that person (or animal) who has meant so much to us. While the link to the site that has comforted you appears to be incorrect, the poem reminds me of my parents telling me, then a small child, that my great-grandfather (who had just passed away) would be "looking down at you from Heaven". Another site that I keep bookmarked for friends who have lost beloved pets is http://www.petloss.com, where there are memorial lists, candle ceremonies, and other rituals of healing (for both people and pets). As with all the loved ones we lose, your loss is keen. May you be comforted during this time of grief, and may Phyllis have passed on her skills to another who, some time down the road, will become your companion for a spell. I am so sorry for your loss! Animals are members of our family, become our close friends & companions and take a piece of our hearts when they come into our lives - and another one when they leave them. I'm so sorry for your loss. Phyllis sounds like a trouper. I love the stories of her traveling all over the country with you. I'm glad she got to spend her last days somewhere comfortable and familiar. Oh Scott, I'm so so sorry. I know how very hard it is to say good-bye. But I also know you did the right thing, you did exactly what Phyllis needed you to do. She is watching over you still, but from a much better place where she no longer feels pain. I am so sorry to hear that Phyllis is gone, Scott. She was quite the companion, from all I've read and heard. I'm so sorry for your loss, Scott. Oh, Scott - I too am very sorry for your loss. She was without a doubt a shining star while here, from everything you've written and Tweeted, and she is without a doubt now shining down from above. You did what was best for her and I'm sure that she knew that in her own way. Best your way, my friend. Oh Scott, I am so, so sorry. I loved reading about Phyllis and I loved how much you loved her. She seemed like such a sweet and cute cat - I'm really sorry you had to let her go. Thinking of you guys ... I'm so sorry!! I am so sorry for your loss. I went through this with my cat of 17 years a year ago. It was a Hard decision, so very hard. I didn't want him to suffer anymore, the vet gave him a month. It would have been selfish of me to keep him around. I miss him every single day. Btw, love the new site/look!